The old General Motors Fiero plant on Baldwin Avenue in Pontiac has been sold to a Lapeer company that is promising to renovate the site for a new industrial development that could bring 50 jobs into the city. “Pontiac needs to rebuild its industrial base, and the sale and planned redevelopment of the Fiero Assembly site is an important step in this process,” said Lou Schimmel, Pontiac’s emergency financial manager. “We certainly appreciate the cooperation of the RACER Trust toward reaching this goal, through their work to find buyers who will repurpose these former GM properties across the city,” he said. The RACER Trust was created during the Obama administration’s auto bailout to dispose of excess property that once belonged to General Motors and Chrysler. Both automakers were restructured as part of the bailout and shed excess land and buildings. 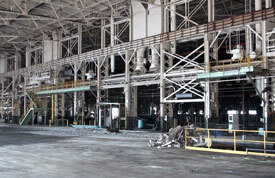 “This is a tremendous piece of property, and it will be well-suited for economic growth once we make some needed adjustments to the infrastructure, removing portions of the building that are simply no longer usable,” said Rick Marcicki, president of North American Dismantling Corp.
“Our purchase of this property paves the way for new long-term jobs here, and we’re excited about the future here,” he said. Terms of the sale were not disclosed. However, with the sale of the property, the RACER Trust has sold more than 20 former GM properties, with total sales proceeds exceeding $26 million. GM built the sprawling plant back in the 1920s for its Fisher Body. The plant fed bodies to the adjacent Pontiac Motor Division assembly plant for six decades before it was converted to build the Pontiac Fiero in the early 1980s. 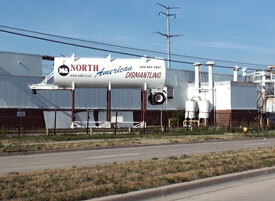 After Fiero production ended in the late 1980s, GM used the site as a warehouse until 2009. “We’re thrilled that the former Fiero Assembly Plant will soon be repurposed to provide new jobs and economic opportunity for the people of Pontiac, ” said Elliott P. Laws, trustee of The RACER Trust. “The Trust’s fundamental goal is to be a catalyst for revitalization at the former GM properties now owned by RACER, and this transaction provides an important opportunity for economic growth both at the site and in the broader community,” noted Bruce Rasher, RACER’s redevelopment manager. Demolition is set to begin immediately on the site and NADC anticipates the new end-user could be fully operational before the end of 2013. 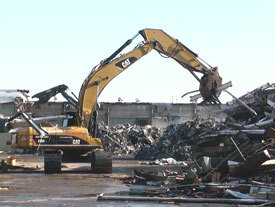 NADC has completed more than $100 million worth of demolition and environmental remediation work in the last five years alone on property previously owned by General Motors, Ford, Chrysler, Eli Lilly, Bayer Chemical and others. NADC has signed a letter of intent with an employer interested in moving operations to the property once it is has been renovated. 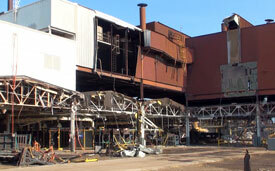 NADC said it would identify the company when a final agreement is in place.